Alaska is the perfect place to ride. Long stretches of winding road and secret little hideaways cover the state. Biking across endless miles of gorgeous scenery, you’ll encounter forests, coasts, mountains, and lots of wildlife. Whether you plan to bring your bike up from the Lower 48 or rent a motorcycle after arriving, you’re in for a great adventure. June and July are the best travel months in terms of weather. But that’s also when hotels, motels, and campgrounds tend to fill up, so it helps to have a general route mapped out and to book accommodations in advance. The Alaska Highway spans nearly 1,400 miles from Dawson Creek, British Columbia up to Delta Junction, Alaska. The entire length is paved and rarely has any weather closures. The road is very scenic and you’ll have plenty of photo ops of beautiful lakes, streams, and pine trees with snowcapped mountains in the background. The entire length of this 127-mile road is designated a National Forest Scenic Byway. You’ll get the chance to see lakes, bays, fjords, and ride past glaciers. Potential wildlife spotting includes beluga whales at the shoreline of Turnagain Arm, and Dall mountain goats in the cliffs of Chugach State Park. This 135-mile road leads north from Anchorage up to Eureka. Designated a National Scenic Byway, Glenn Highway runs parallel to the path carved out by the Matanuska Glacier. Many glaciers dominated this area in past times, resulting in mountain peaks and river valleys. Today, this countryside provides some of the best glacier viewing in the state. This 138-mile road connects Moose Pass to Homer, Alaska. Two separate stretches of the road are designated State Scenic Byways. The most beautiful portion is around Kenai Lake past the Cook Inlet and through the Skilak Lake area. This short stretch of road (49 miles) north of Anchorage is popular with bikers because of its twisties and sweepers. Hatcher Pass is a great day trip, especially in fall when the foliage is changing colors. But be careful of rainy conditions as some sections are not paved. 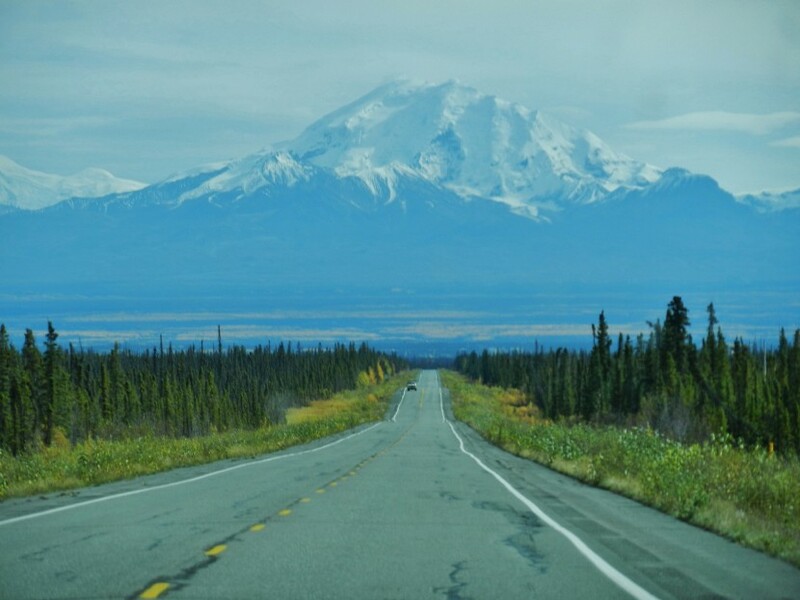 The road was built originally to give miners access to the Talkeetna Mountains, so you’ll encounter lots of historical sites and structures. You can even stop to tour Independence Mine, once a large gold mining operation. This road, known as Top of the World Highway, promises spectacular views throughout its 155-mile length. Much of the road is unpaved and isolated, guaranteeing a peaceful ride through the amazing landscape. This trip covers much of the Yukon Territory, including the land that is home to the Yukon Quest sled dog race in the winter. Paths up the mountains can be narrow and some lack guardrails, so please travel slowly. The Dalton Highway, also called Haul Road, is over 400 miles long running between Fairbanks and Prudhoe Bay. Definitely not for the feint of heart, this drive has been featured on Ice Road Truckers. Some of the journey is over gravel, and there’s a 240-mile distance between fuel stops from Coldfood to Prudhoe Bay. This trip is best taken during June or early July, which is the dry season in Alaska. When you reach the end of the line at Deadhorse, plan on lodging in the work camp, as there’s no motel in town. This trip features stunning scenery, a leisurely segment through Denali National Park, and lots of native wildlife. And on a clear day you can see all the way to the Arctic Ocean from the peak of the Brooks Range. Carry a copy of The Milepost travel planner. This road warrior bible includes maps, road conditions, ferry schedules, and info on accommodations. You won’t always have a working cell signal on the road, so this comprehensive (800+ pages) book may save you from getting lost.